Hollywood is known for immortalizing that climactic moment when a movie character suddenly drops to one knee, presents a classic diamond ring, and dramatically declares devotion to the unsuspecting lover. Granted, one automatically associates the action of proposing marriage with the male gender. This concept of men governing women and orchestrating their futures through betrothal emerges in the following artifact from the collection of Elie and Viola Nadelman, on display this past summer at New-York Historical. Unidentified European Maker. Painted Boxes, Betrothal or marriage coffer, 1580-1660. 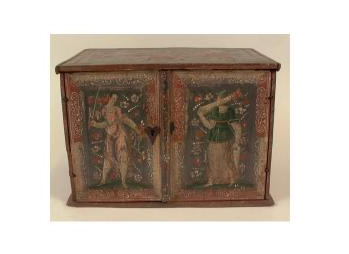 The betrothal coffer, or wedding box, from the late 16th or early 17th century, is composed of wood, gesso, paint, a silver pigment (which remains uncertain), and iron, as well as other unidentified mediums. Observing the frontal face of this intricately crafted art piece, gifted to a bride-to-be by her fiancé, there are two figures presented against a backdrop of graceful floral and swirl patterns. Positioned between these two painted individuals is a heart-shaped lock. The box’s inner composition features a number of nifty compartments designed to store a woman’s valuables like jewelry and other small trinkets. While operating the Museum of Folk and Peasant Arts, the Nadelmans cataloged the betrothal coffer under “toys” as a result of its physical vibrancy and aesthetic appeal. However, after realizing both the coffer’s practical and symbolic purposes, the couple’s classification becomes questionable. 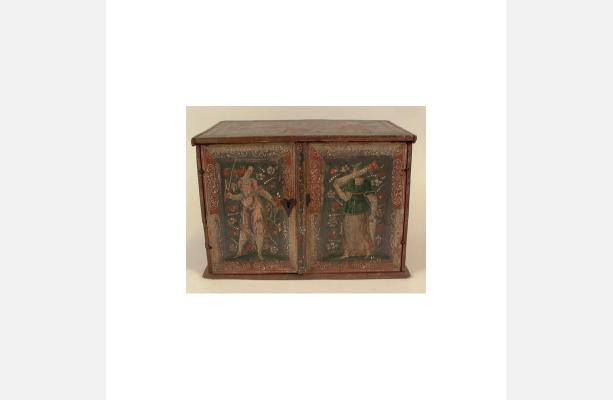 The box is more than just a pretty, decorative ware; it is a living embodiment of the unwanted social condemnation women had to endure under a male-dominated order. Every visual detail of the betrothal coffer is emblematic of these chivalric ideals that prevailed from the Middle Ages and into the European Renaissance. Firstly, the lock is symbolic of medieval literature, as your typical knight in shining armor would state to his fair maiden, “Lady, you carry the key / and have the casket in which my happiness / is kept.” Further, the painted individuals—one clutching a sword, the other carrying a column—are representative of “Prudence, Justice, Fortitude, Temperance, Faith, Hope, and Charity,” which all derive from the Christian Virtues every wife is expected to uphold. Seen through the flowers is the imagery of efflorescence, suggesting fertility and budding romance. The extra embellished swirls convey the beauty every man seeks from his chosen woman. Throughout the subsequent 18th, 19th, and 20th centuries, women were still experiencing the same marginalizing pedestal treatment. This second artifact, however, stands as a marker of women resisting the encroaching worldview supported by the betrothal coffer. 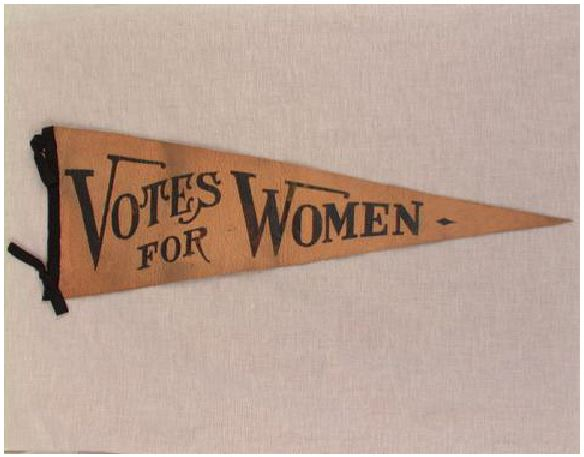 The object dates to the early 20th century and is really quite simple in design, consisting of a tan fabric cut into a pennant with the words “Votes for Women” emblazoned in black across the front. 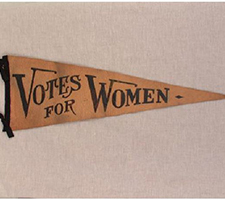 As America experienced a burgeoning women’s suffrage movement that began with the 1848 Seneca Falls Convention, these pennants were widely distributed to members of national suffrage organizations during street protests. Just the action of parading unaccompanied through busy city streets was political statement enough as women were to be closely guarded by their respective husbands. Finally, on August 18, 1920, following centuries of oppression, the 19th Amendment to the U.S. Constitution was ratified, granting American women the right to actively participate in democracy as the valuable citizens they are, and always were. With this coming presidential election, our country may have our first woman president. Although we have dramatically progressed toward securing gender equality to allow for such a likelihood, it is important to realize the ground that still needs to be covered in our 21st century. Federal statistics still indicate the presence of gender inequality today, especially in working place environments. Though we have yet to rid ourselves completely of the chivalric view, we are slowly, but surely, headed on an upward trend. “Chivalry.” Renaissance: An Encyclopedia for Students. Ed. Paul F. Grendler. Context. Web. 7 July 2016. Historical Society in association with D Giles Limited, London, 2015. Metropolitan Museum of Art. Last modified 2000-2016. Accessed July 7, 2016. Constitutional Conflicts. Last modified 2016. Accessed August 8, 2016.